It is hard to believe that fall semester classes end today. The semester has flown by. If all goes as scheduled, our first-year students will be in Civil Procedure from 8:50am until 10:10am. Following an hour break, they will finish the semester with Torts from 11:10am until 12:30pm. Professors Gash, Cochran, and Miller will have the honors of closing the lid on the semester for our 1Ls. The last day of classes is a strange day in the life of a law student — especially the first time around! By this point, students are so ready for the semester to end that there is an element of elation in realizing “no more reading” and “no more getting called on in class” and “no more new material.” And, yet. The elation is more than tempered by the flock of butterflies doing somersaults in your stomach when you turn and face final exams. Yes, today is a significant day. But in a sense, it feels as if everything so far has simply been prologue. Professor Kris Knaplund is one of our most popular professors. She is considered a pioneer in the Academic Support community for work she did at UCLA Law, but for students at Pepperdine Law, she is known as a fantastic professor in the disciplines of “Property” and “Wills & Trusts.” Many would say that her reputation as am amazing faculty mentor is even more important than her academic expertise. This is a rare year when Professor Knaplund is not teaching first-year students. Hopefully, many will take her “Wills & Trusts” course as upper division students. You can CLICK HERE to see a current Today Show video segment that features Professor Knaplund as the “Wills” expert that she is. Thanksgiving is Never Really Over, but the Break is Over! 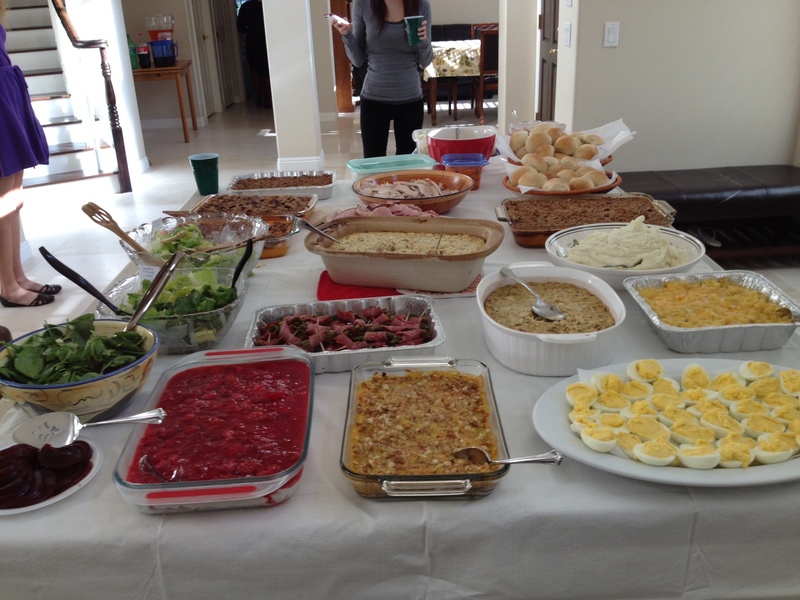 We had quite a feast on Thanksgiving Day! Professor Gash and his family graciously allowed my family to use their home to host law students for Thanksgiving Dinner. After surviving a little power outage on Thanksgiving Eve, twenty of us gathered together for an amazing meal. Among many reasons I have to be grateful, I was especially cognizant of two: (1) the privilege of spending time with so many wonderful students; and (2) my amazing wife — how many wives out there would allow their husband (who can’t cook) to issue an open Thanksgiving invitation to 650 people? But today, it is painfully obvious that Thanksgiving break is over and finals season is close at hand. Classes will meet today, tomorrow, and Wednesday, followed by our final exam period that runs from December 3 to December 14. Today, on Thanksgiving Eve, I pause to give thanks for the special opportunity to work with such an amazing group of students. Today, in particular, I am struck by the privilege I have to meet the students via technology even before they arrive on campus, be with them throughout all three years of law school, and then stay in touch throughout the bar exam until their successful swearing-in ceremony. I am astounded that anyone could have such a privilege, even more that I have this treasure in my possession. Thank you for sharing your family and friends with me. I do not take this blessing lightly, and I will remain ever thankful. Today is the last day of classes before Thanksgiving break. Before the 1Ls sneak out the door this afternoon, we have scheduled a lunchtime workshop on “Preparing for Finals” through our Academic Success Program. In this workshop, I will moderate a panel comprised by my six ASP Teaching Fellows, and the panel will discuss everything from study calendars to self-care to what to expect on the day of the exam. As I explained previously, the Academic Success Program strives to “pull back the curtain” and provide everyone access to the same tools and resources. Our fall semester workshops come to a close today, and we will turn these bright and talented students loose on preparing for finals! Technically “memo” is a four-letter word, but who would have guessed that such an innocent word could become a dirty word to our 1L class? Many of you know that the 1L class has been feverishly composing a memo for their Legal Research & Writing (LRW) course that is due today. I believe this memo is worth 70% of the grade in this course. I do not have pleasant memories of working on the memo, but I do have a rather fond memory of how it feels to turn it in! In short, turning in this memo signals the end of LRW for the fall semester. As a result, full attention can be devoted to the final exam period. For this year’s class, with LRW completed, there are three courses that remain prior to a much-anticipated semester break — Civil Procedure (final on December 5), Torts (final on December 10), and Property (final on December 14). One of the cruel tricks law school plays on a student comes after graduation in an event known as the bar exam. Generally speaking, the Monday following a glorious commencement ceremony on the pristine front lawn at Pepperdine ushers in a grueling summer of study that is worse than any other aspect of law school. The summer culminates — in California at least — with an eighteen hour exam spread out over three days at the end of July. The word miserable comes to mind. Adding insult to injury, the grading process is slow, and California bar applicants must wait in suspense almost four months to know if they can be sworn in as an attorney — or not. For 174 of last year’s graduating class of 206, tonight is the night they find out the results. At 6pm PST this evening, each individual applicant (there were 8,852 in California last summer) will be able to log on to the State Bar of California website to learn if he or she passed. The list of those who passed will be made public at 6am on Sunday morning. We at Pepperdine Law are quite proud of our performance history on the California Bar Exam. Last year, the pass rate for our first-time takers was 86% (compared to the overall state rate of 68%), which ranked us among the top schools in the state. Still, every year, we all get nervous. One of the worst parts is that, due to the difficulty of the California Bar Exam, even in our best years we know that some of the students we love will have a rough night. So we have a big night ahead! For those of you given to prayers, I know 174 people who would appreciate a good word or two. Our first year students attended their last of three mandatory “professional development” presentations of the semester yesterday. The September presentation focused on professional health. October’s focus was the professional use of social media. Yesterday’s topic was professional etiquette. Both speakers did an outstanding job, and I believe several of the pointers shared will serve as valuable seeds as our new students begin their growth toward becoming respectable members of the legal profession.